Doug has been most helpful in restoring my body through injuries and stress. He is a kind and attentive listener as well as a very skilled physical therapist. I am most grateful. My daughter came to get Physical Therapy with Jill, as part of her back injury from playing basketball. She was in 7th grade and was on the Girls Modified Basketball team. She recovered very nicely, and thanks to Jill’s intervention and support, was back on the court the week after she ended PT! And, the best news is that she's been playing as part of a travel basketball league this past spring and into June, and her back was completely strong and healthy for every practice and game. SO thankful to Jill for helping my daughter to get back to good health! Don’t dread P.T. at Kulp! Doug is a fixer. His goal is to get you back to 100% in the most efficient and effective ways. Nothing fancy- just tried and true technique- he is THE BEST! Get better sooner at Kulp P.T. John is a Massage Specialist (more than a therapist) at Kulp Physical Therapy and Massage and he has recently joined my list of most favorite people. He has knowledge and techniques that are amazing and he applies both in a very caring professional way. I would immediately recommend John to my friends and co-workers. Doug has been treating my arthritic body so that I am able to participate and enjoy my many physical activities. I have had back problems where I would walk into the office bent over and in pain, after my treatment with Doug, I walked out pain free & upright. I (also) suffered from frozen shoulder. After several visits and enduring the pain, Doug released it so normal movement returned. I am very grateful for the care he has provided to me. I have very compromised muscle weakness and require P.T. once a week. Janelle & Doug have both made my body pain free and I am able to function with the activities of daily living. Thank you both! I came in having difficulty raising my arm after a fall. After seeing MANY Doctors and having MANY tests which did not show any problems, Janelle Allen, upon examining me, found that it was damage to my nerve. Janelle is fabulous and excellent at her job; a true caring and compassionate person. I am an 81 year old man who has been treated by Doug Kulp many times for multiple issues; including Frozen Shoulder, back problems, and 2 knee replacements. My wife has also gone to him for her knee replacements, a shoulder problem, back problems, and currently a hip problem. Doug is extremely knowledgeable, professional, gives individualized treatment with interest, caring, and encouragement. He is always a pleasure to see. My entire family has repeatedly turned to him whenever one of us needs his expertise. 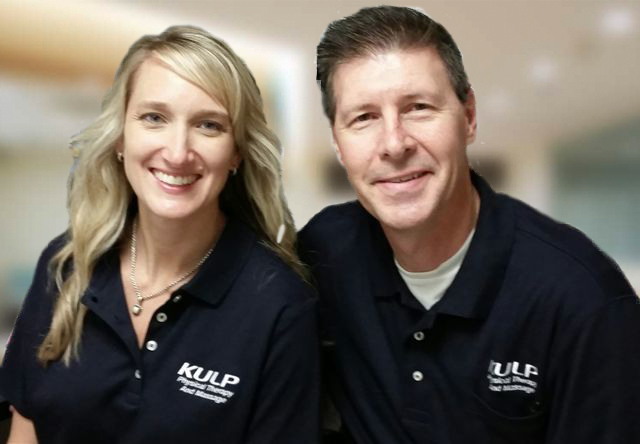 Kulp Physical Therapy in Victor is the place to get your PT. They provide hands-on treatment that is individualized for your specific needs. Dr. Jillian Schwartz is my physical therapist. Her treatment and techniques have proven highly successful for my knee. Especially helpful are the deep muscle techniques to the muscles attached to the knee. No one has ever worked on them in relation to my knee problems and this has made a huge difference in my recovery. I cannot say enough about the entire staff there and their highly competent clinicians and office staff. They are exceptional and have unique expertise and knowledge. Hands down, the best practice there is in the Victor area. I’ve spent a considerable amount of time at the practice over the past 5 years due to an ongoing medical condition. Doug has exceptional skills and techniques that he employs that provide me with relief for a very difficult, unique and challenging medical condition to treat. You won’t find a practice with the level of knowledge and expertise that Doug and his staff provide. Prior to this office, I had attempted treatment from 7 different physical therapist over a 10 year period. They all had and forced the same generic treatment plan that did further harm than good. All 7 attempts were unsuccessful. After the first visit with Doug, my body immediately responded. I had regained a small range of motion that I hadn’t had in over 10 years. The Kulp team is truly invested in their patients and always puts them first. They take the extra time to ensure individualized quality care is provided. Their small office is more like a family than just staff. You’ll never be just a number. You’re known by your name and are always treated with the utmost kindness, compassion and respect. They’re never afraid to think outside the box and carefully listen to their patients needs to provide superior care and customized treatment plans. My daughter has also been treated by Doug for a few sports injuries. A solid individualized treatment plan was created and successfully completed. She healed ahead of schedule and was back on the field earlier than anticipated with no further complications. You’ll always be in good hands and be provided with high quality consistent care here. John is excellent! My upper back and shoulder tightness are relieved. Will be back and recommend others. I have been seeing Janelle for about eleven years, since my first rotator cuff surgery. Since then, anytime I need help, I have returned to Kulp Therapy and Janelle. I had hip replacement surgery eight years ago. The healing process was greatly accelerated thanks to the care I got here. I have been back many times for various maladies. The care and attention here are incomparable. I wouldn’t think of going elsewhere. Thank you everyone at Kulp Therapy, staff is very efficient and friendly. I have had 4 surgeries in my adult life, which have left me with complex physical issues. After many attempts at physical therapy I had to stop because the problems only increased and I would be left with more pain. I felt it was hopeless. Due to a friend’s recommendation I started to work with Doug Kulp and he used Trigger Point Therapy, which I had not experienced in the past. I had immediate results and could not believe how effective it was. Not only did it not cause any pain or problems but my symptoms started to diminish immediately. When I first went in to Doug I figured I was about 70% ready for hip and/or knee surgery – probably both. After working with him for about 6 months my symptoms have decreased, my function has improved substantially and now I think of surgery as a 20% option for some time in the future, when needed. In addition, Doug successfully treated a neurological problem I was having for which my Neurologist said there was no cure except for Botox or surgery. I had good results after the first treatment. With a certain amount of education a person can be considered a Physical Therapist. However, we all know that there are very different levels of skill and mastery. Words cannot adequately convey what a miracle this has been for me and I would highly recommend working with Doug for whatever problems you might have. Thank you for the very effective PT.....it was well worth the 2 hours of driving to feel better again. I will be sure to recommend your services to friends. Janelle’s physical therapy has been very helpful to my pre-surgical knees. She is very gentle but very effective. I would highly recommend her to anyone needing physical therapy.